Beginning May 1st, 2018, the days of text and e-mail to reserve a walk for your faithful companion are a thing of the past. 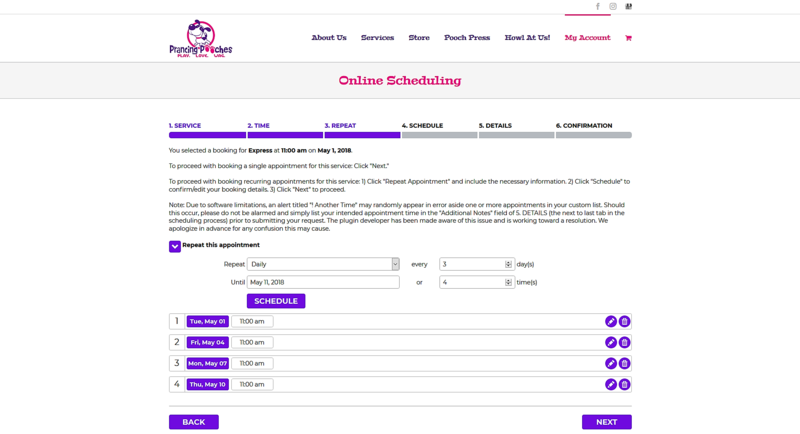 To assist you with this dramatic change in our booking procedures, we’ve created a simple and seamless process to schedule online appointments for every single service that we offer. We are officially pleased to announce that setting up visits for any of our services is now just a couple of clicks away! Once you’ve completed the Get Acquainted Visit and become a member of our pack, you’ll be prompted to create a personal login during your first online checkout of our services. Now every time you return to our website, just sign-in using the “Login” link (located at the top right-hand side of the homepage) and a new tab will appear labeled “My Account.” Here you can access Online Scheduling from the drop-down menu, view My Calendar (a complete list of all past and future services that you have scheduled through our website), as well as make any important changes to your personal information using your Account Dashboard. Making appointments for all your desired services has never been so easy! Just follow our simple on-screen tutorial from the steps below to learn how to quickly view all upcoming time slots available, and how to instantly book your reservations. Because less time with all the hassle means more time with your furry friend. Which is exactly the way it should be. 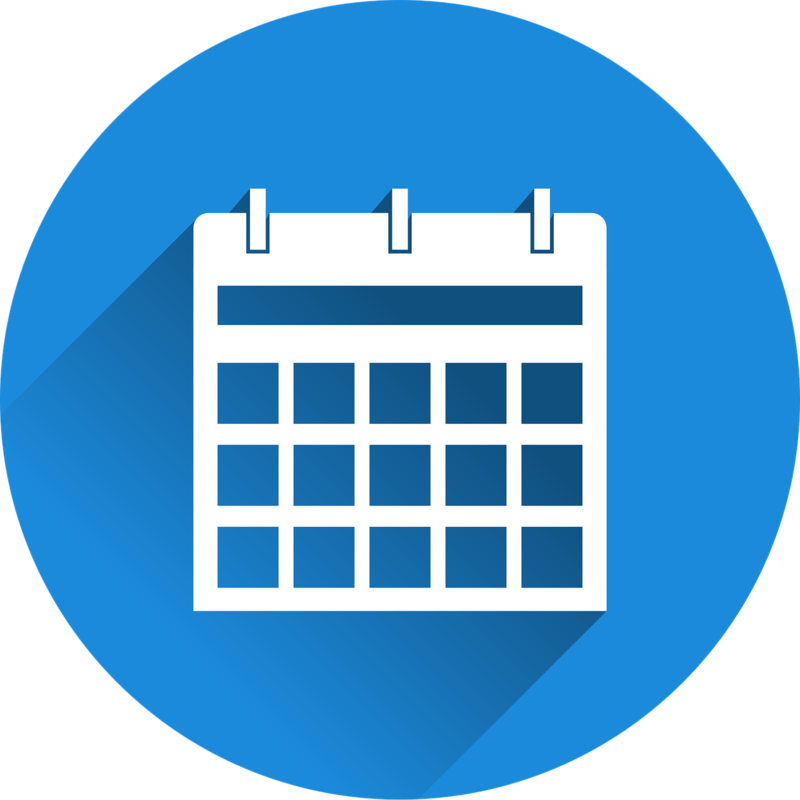 For clients wishing to automatically populate their Calendar with appointments for the scheduled service up to a particular date, this tool makes it easy to schedule multiple visits in a single session. 1) Choose the repeat interval and number of days between visits (and select the finish date) from the menu that appears. The number of visits category will automatically adjust to reflect the total number of services you have scheduled. 2) Click “Schedule” to review the list of recurring service appointments. Use the edit and delete icons to make any modifications to your intended schedule. Note: Due to software limitations, an alert titled “! Another Time” may randomly appear in error aside one or more appointments in your custom list. Should this occur, please do not be alarmed and simply list your intended appointment time in the “Additional Notes” field of 5. DETAILS (the next to last tab in the scheduling process) prior to submitting your request. The plugin developer has been made aware of this issue and is working toward a resolution. We apologize in advance for any confusion this may cause. View the complete schedule and times of your requested service to confirm that all necessary dates have been listed, and none have been left out. Use the edit and delete icons to make any modifications to your intended schedule. 1) Fill in all required properties (including Pet Name) for each service scheduled, and provide optional “Additional Notes” in the space provided should you feel the need to add any more information pertinent to your booking. The Online Scheduling process is complete and your request has been submitted once this screen appears on your device. Please check your inbox for an email confirmation with additional details about your reservation(s). We know that this is a rather big change and are here to support you every step along the way! This is a major upgrade to our way of doing business, and the modifications made were necessary to not only improve your customer experience with us, but also streamline the scheduling process for all clients of Prancing Pooches so that each may continue to enjoy the premium services they’ve grown to know and love. That said, please keep in mind that if you run into any issues or encounter any problems with the new system whatsoever, big or small, we have an “open door” policy and are only a phone call away. But we’re confident that once you get the hang of it, you’re going to love it as much as we do!